Thinking out-of-the-box can produce some fantastic entrepreneurial results. 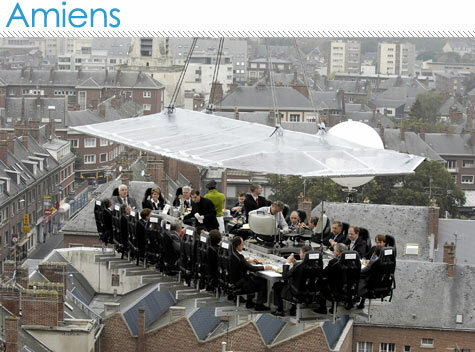 For example can you imagine having breakfast, lunch, cocktails or a meeting in the sky? 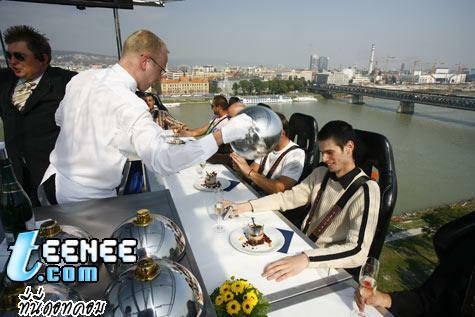 Dinner in the Sky, launched as a joint venture with The Benji-Fun Company in 2006, and also ranked by Forbes magazine as among the world’s top ten most unusual restaurants the same year, takes place at a table suspended at a height of 165 feet by a team of professionals. 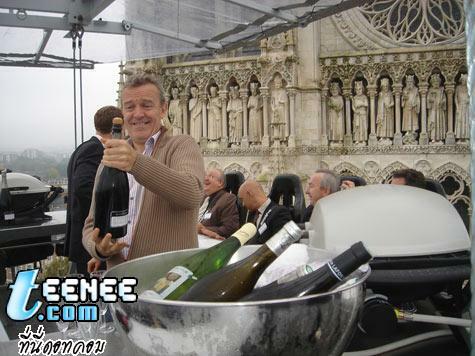 Available for a session of eight hours at the cost of around $11,400, not including catering, Dinner in the Sky seats twenty-two people around the table at every session and three in the middle (chef, waiter, entertainer…). While clients book in eight hour blocks, rarely does the restaurant stay airborne for more than two hours at a time, allowing for refreshment refills and bathroom breaks. Ghysels sees all sorts of expansion possibilities in the U.S. for the dangling restaurant, including air space over the Grand Canyon, Niagara Falls and golf courses. “I think human beings always like to see what’s happening from the air,” he says. 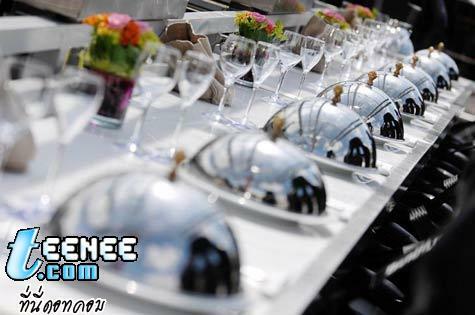 “And there are so many wonderful natural spots in the U.S. Dinner in the Sky could go anywhere.” However, one of the reason we have not seen more about this concept being launched here, yet, is because of the astronomical price of insurance required for each event. Businesses that have used the service overseas include Coca-Cola, Les Vins du Val de Loire, San Pellegrino – which suspended a piano – and the Irish Dairy Board, which, disappointingly, resisted dangling a cow. For one publicity stunt in Holland, Bavaria Beer created a four-sided wooden beach bar, complete with hammocks and palm trees “with roots trailing” for maximum effect. 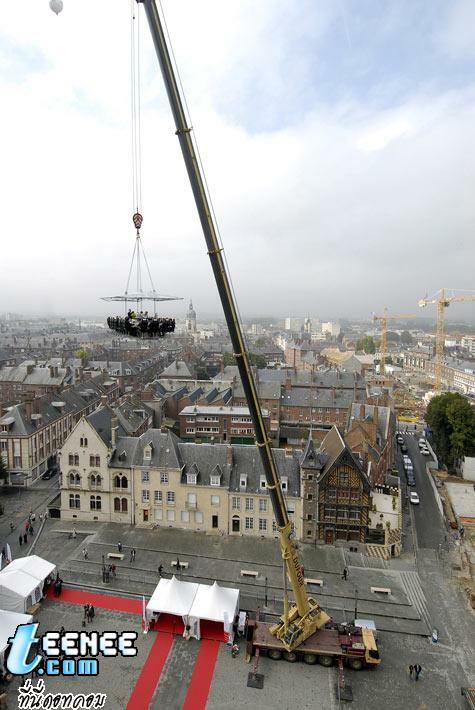 The concept of Dinner in the Sky, as an event, allows it to be organized anywhere: on a golf course, at the race track, oceanside, in a vineyard or a historical site. As long as there is a surface of approximately 1600 feet that can be secured, with, of course, the authorization by the owner. Considering Ghysels is selling, basically, a customised platform, he appears to have done very well with thinking out-of-the-box. 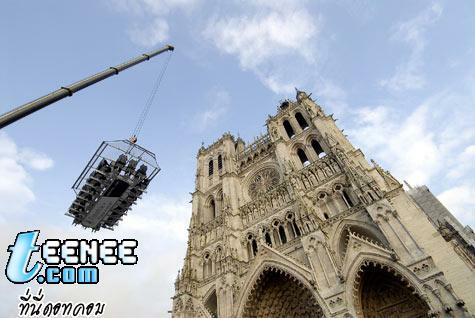 So far, the company has raised the platform in Belgium, Holland, Portugal and the UK. Slovakia, Germany and South Africa are imminent and Ghysels says he is in talks with a client in Dubai, where cranes are even more plentiful than moneyed thrill-seekers. He is also fielding requests from New Zealand, Australia and Hong Kong. 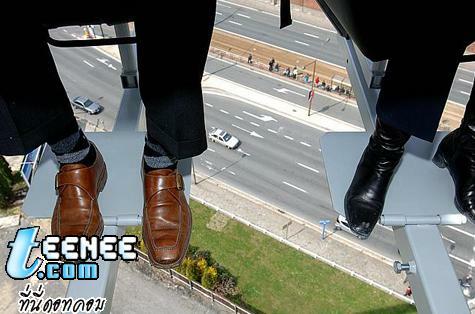 In fact, the cost of the annual German security certification – “the strictest of all of them and the one we wanted” – is the reason that Dinner in the Sky has not as yet recorded a profit. “At the end of this year we should break even,” predicts Ghysels who is confident that the company will really take off in 2008.